For other uses, see Grouse (disambiguation). Grouse make up a considerable part of the vertebrate biomass in the Arctic and Subarctic. Their numbers may fall sharply in years of bad weather or high predator populations—significant grouse populations are a major food source for lynx, foxes, martens, and birds of prey. However, because of their large clutches, they can recover quickly. Male grouse display lekking behavior, which is when many males come together in one area and put on displays to attract females. Females selectively choose among the males present for traits they find more appealing. Male grouse exhibit two types: typical lekking and exploded lekking. 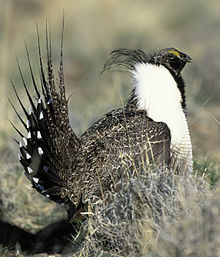 In typical lekking, males display in small areas, and in exploded lekking, displays are done in areas that do not have many resources for females. Male grouse can also compete with one another for access to female grouse through territoriality, in which a male defends a territory which has resources that females need, like food and nest sites. These differences in male behavior in mating systems account for the evolution of body size in grouse. Males of territorial species were smaller than those of exploded lekking species, and males of typical lekking species were the largest overall. The male birds that exhibit lekking behavior, and have to compete with other males for females to choose them, have higher sexual size dimorphism. This supports the hypothesis of sexual selection affecting male body size and also gives an explanation for why some species of grouse have a more drastic difference between male and female body size than others. ^ Gutiérrez, R. J.; Barrowclough, G. F.; Groth, J. G. (2000). "A classification of the grouse (Aves: Tetroninae) based on mitochondrial DNA sequences" (PDF). Wildlife Biology. 6 (4): 205–212. doi: 10.2981/wlb.2000.017. Archived from the original (PDF) on 2015-03-27. ^ "AOU Checklist of North and Middle American Birds". American Ornithologists' Union. Retrieved 2014-03-13. ^ "Tetraoninae". Integrated Taxonomic Information System. Retrieved 2013-03-13. ^ Boyd, John. "Phasianidae: Turkeys, Grouse, Pheasants, Partridges". Aves – A taxonomy in flux. Retrieved 2014-03-13. ^ Rands, Michael R.W. (1991). Forshaw, Joseph (ed.). Encyclopaedia of Animals: Birds. London: Merehurst Press. p. 91. ISBN 978-1-85391-186-6. ^ a b c d e f g h i Storch, Ilse; Bendell, J. F. (2003). "Grouse". In Perrins, Christopher (ed.). The Firefly Encyclopedia of Birds. Firefly Books. pp. 184–187. ISBN 978-1-55297-777-4. ^ a b c d e f g h i j k l Drovetski, S. V.; Rohwer, S.; Mode, N. A. (2006). "Role of sexual and natural selection in evolution of body size and shape: a phylogenetic study of morphological radiation in grouse". Journal of Evolutionary Biology. 19 (4): 1083–1091. doi: 10.1111/j.1420-9101.2006.01097.x. PMID 16780509. ^ a b Fiske, Peder; Rintamaki, Pekka; ≈Karvonen, Eevi (1998). "Mating success in lekking males: a meta-analysis". Behavioral Ecology. 9 (4): 328–338. doi: 10.1093/beheco/9.4.328. ^ Soulsbury, Carl D; Kervinen, Matti; Lebigre, Christophe (2014). "Sexual size dimorphism and the strength of sexual selection in mammals and birds". Evolutionary Ecology Research. 16: 63–76. ^ Mueller, H.C. ". The Evolution of Reversed Sexual Dimorphism in Owls: An Empirical Analysis of Possible Selective Factors". The Wilson Bulletin. 98 (3): 387–406. De Juana, E. (1994). "Family Tetraonidae (Grouse)". In del Hoyo, J.; Elliott, A.; Sargatal, J. (eds.). Handbook of the Birds of the World, Vol. 2. New World Vultures to Guineafowl. Barcelona: Lynx Edicions. pp. 376–411. ISBN 978-84-87334-15-3. "What Do Grouse Eat?". The Upland Hunter. 1 September 2017. Wikimedia Commons has media related to Tetraoninae. Johnsgard, P. (1982). "Etho-Ecological Apects of Hybridization in the Tetraonidae". World Pheasant Association Journal. VII: 42–57. "Grouse" . New International Encyclopedia. 1905.